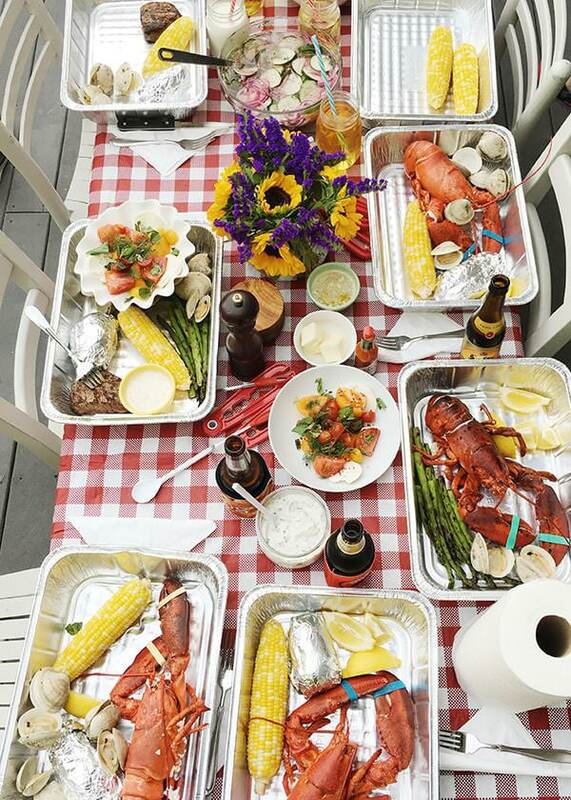 I teach you how to have a lobster bake at home. This is an ideal meal for entertaining. Make ahead, easy clean up, and LOBSTER! 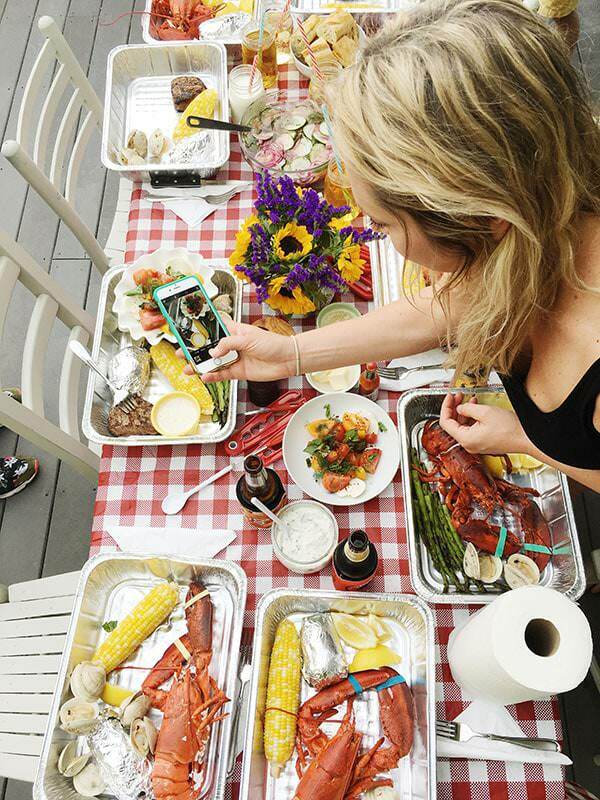 Summer in New England means one thing – LOBSTER! From June until September we have a lot of house guests. It’s funny, we’ve lived all over the country and no one ever really wanted to visit us before. Now that we live on Cape Cod, everyone all of the sudden wants to see us. Hmmm…. interesting…. 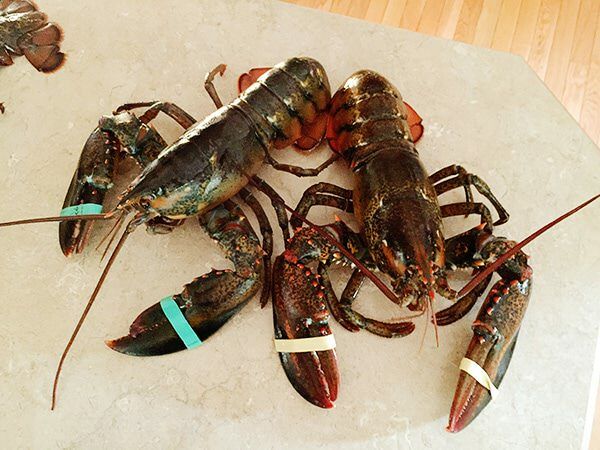 There is a better than good chance that if you come to my house you will have a traditional lobster dinner. I love making this for people because it is a.) SO New England b.) it is all prep, very little hands on and c.) super easy to clean up. I’ve made this so many times, and each time it is just as fun and special as the first. Everyone hangs out, has a drink before dinner, plays a little corn hole or ring toss, and it is completely relaxed and chill. I like to buy 1 1/2 pound lobsters. I think that they are a perfect size. Smaller – and you are still hungry. Larger – I think that the meat is tougher and harder to cook. I steam my lobsters in a big canning pot with just about 2 inches of water, salt (a lot of salt so that it is like sea water), and a few lemons that I’ve halved. I squeeze out the juice and throw them into the pot. I set a timer for 18 minutes. When the knuckles and the head are bright red, you can take them out. I’m also thinking about getting a turkey fryer to take the whole operation outside. 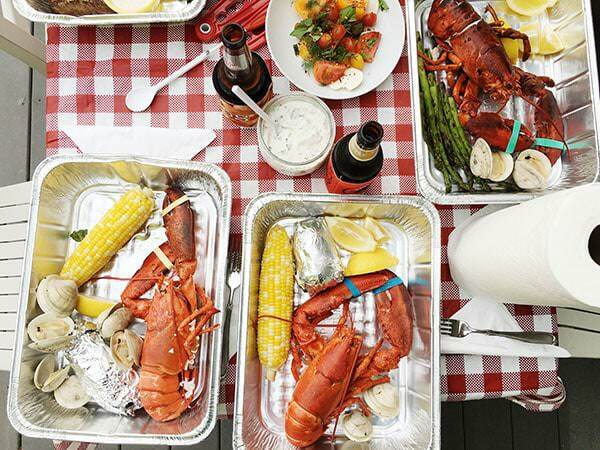 At our house, we have a lobster bake tradition. 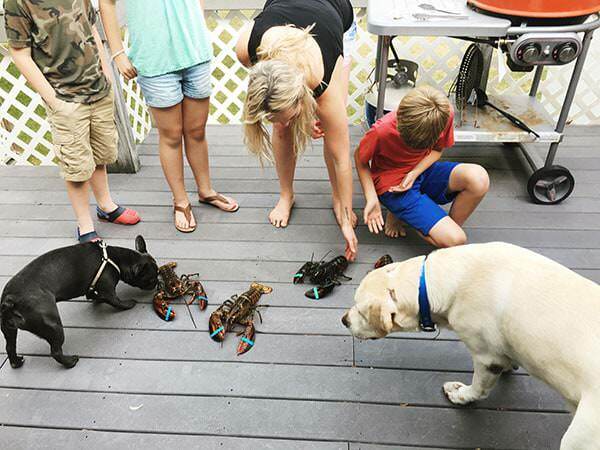 Everyone picks out their lobster and then races it on the deck. The kids love it – the dogs are not so sure what to make of it. The key to an easy clean up is to serve it in disposable foil pans. In New England, we have Ocean State Job Lots and Christmas Tree Shop. They sell these pans, and are less than a dollar apiece. I stock up and buy 50 at the beginning of the season. (They are also my pan of choice for making marshmallows which I make about 100 times a summer.) I put down a disposable table cloth, and a few rolls of paper towels. My dessert flip flops between blueberry crisp or ice cream sundaes. It depends on if there are kids or not. I can get everything ready in the morning, go to the beach all day, and then come home and steam some lobsters and dinner is ready. 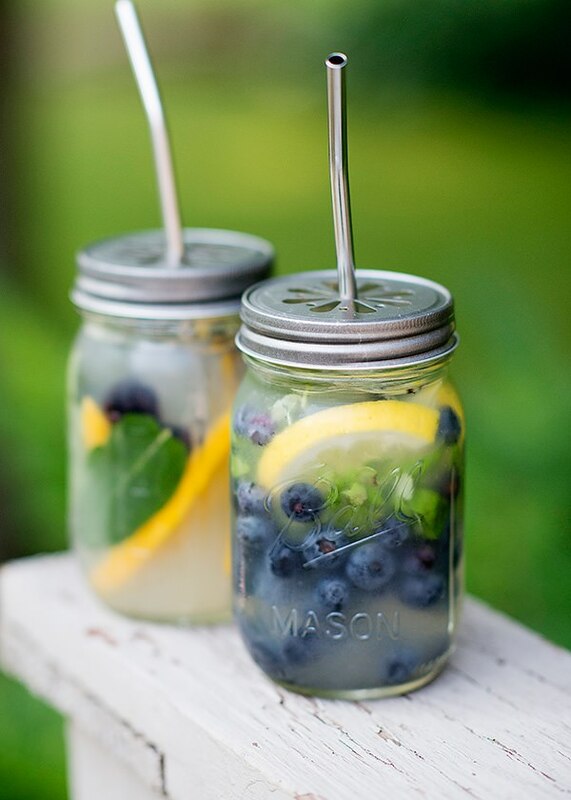 Mason Jar Beach Cocktails – The perfect summer beverage for the beach and also for cocktail time before lobsters. 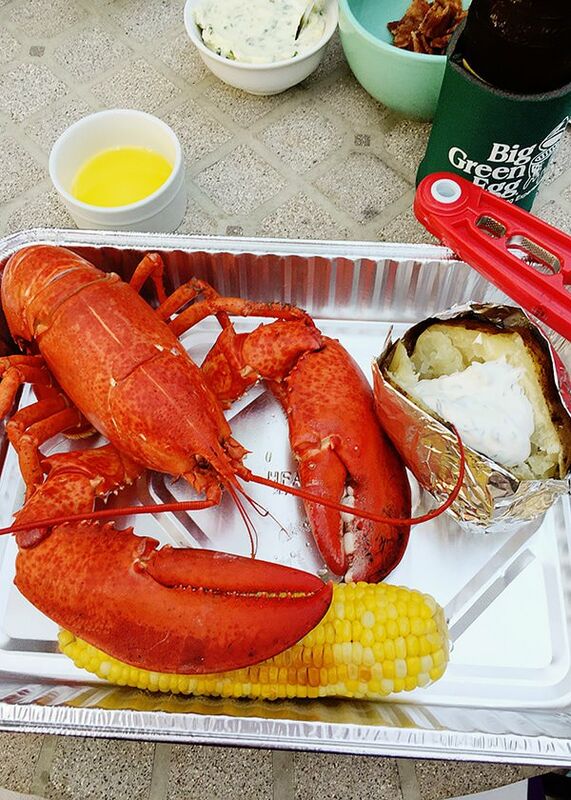 I personally think that there is nothing better than an icy cold beer with lobster. But these are a good way to get the party started. 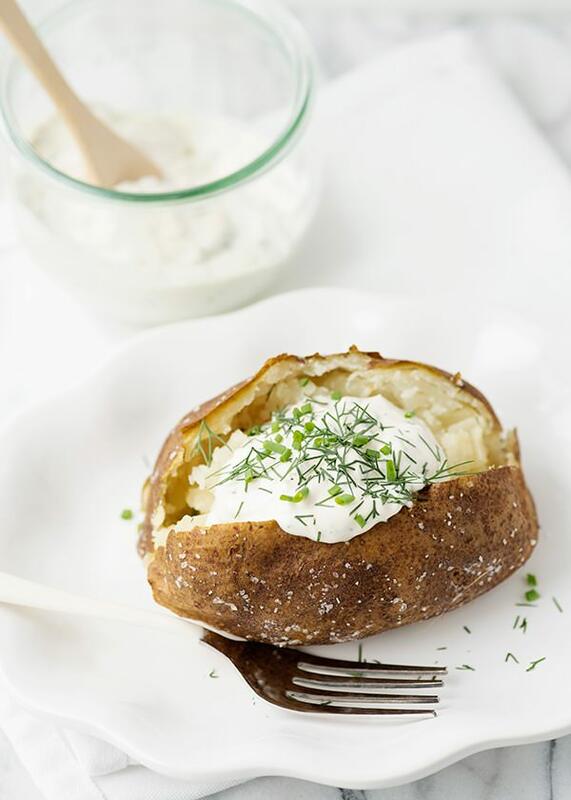 Baked Potatoes with Herb Garlic Sour Cream – This herb garlic sour cream is everything. 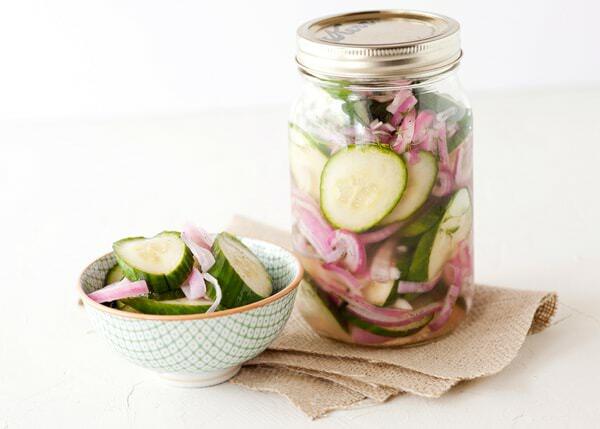 Cucumber Salad – I really love this crisp and ice cold salad alongside lobster. Anything really, but particulary lobster dinner. My grandmother’s famous garlic bread recipe. 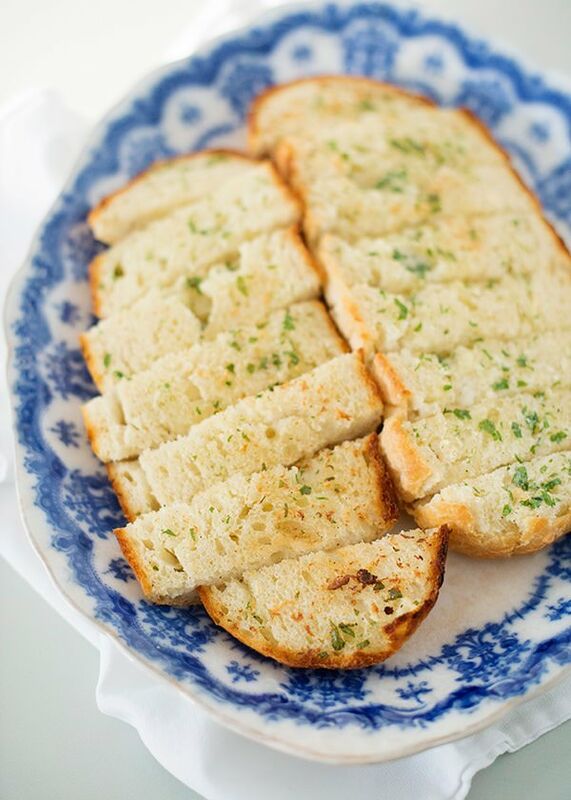 It is seriously the best garlic bread ever. Last time we had this, someone had the genius idea to make a little garlic bread lobster sandwich. I’m so angry at myself for not thinking of it ages ago because it is heavenly. To make Bobbie’s garlic bread, mix one stick of super soft unsalted butter with one clove of finely minced garlic. (I use my microplane for this job.) Add a tablespoon of finely chopped parsley, salt, and pepper. Mix well. 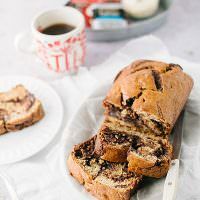 Slice a loaf of Italian bread in half. Slather both halves with butter, be generous. Put it back together and wrap it in foil. Bake in a 350° oven for 15-20 minutes until the bread is crisp on the outside, but soft and melty on the inside. 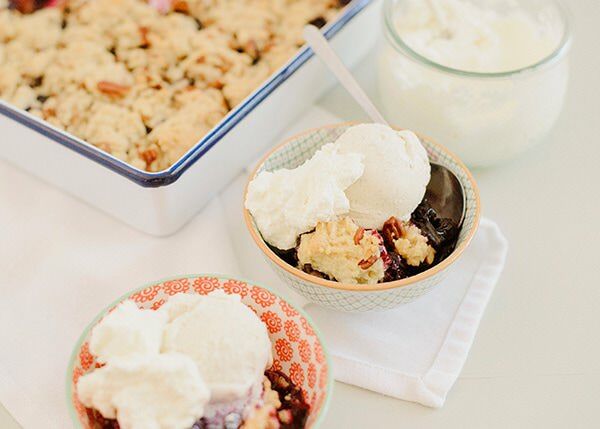 Finish off this meal with either blueberry cobbler or crisp. Make it early in the day, keep it in the fridge, and bake it off while you are cracking your lobsters. Top with vanilla ice cream and whipped cream. Trust me. Have leftover lobster? (It’s a good problem to have.) 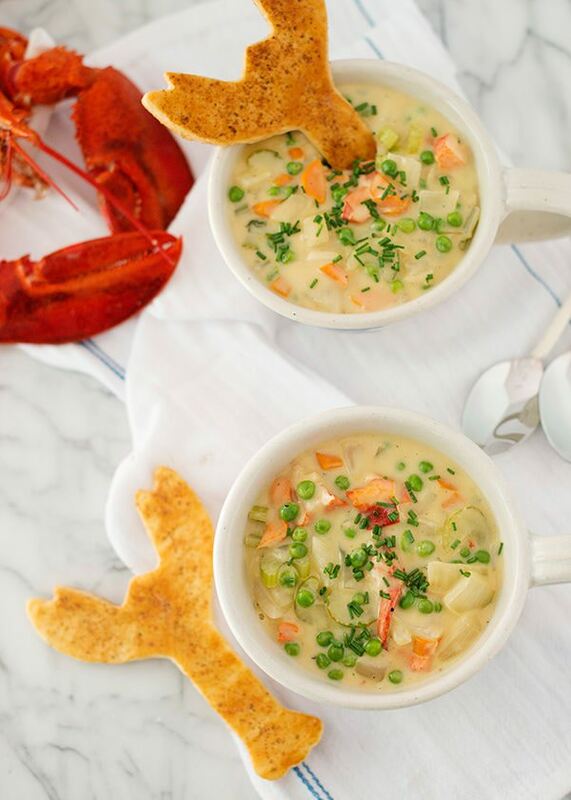 Make my Creamy Lobster Stew with Puffy Pastry Crackers. I promise you, it might be worth cooking up an extra lobster so you can whip up this incredible stew. The Old Bay puff pastry crackers are beyond good. I’m drooling right now. Let’s also not forget how this meal is just asking to be Instagrammed/Snapped/Tweeted all of the social things. Do you have lobster bakes? 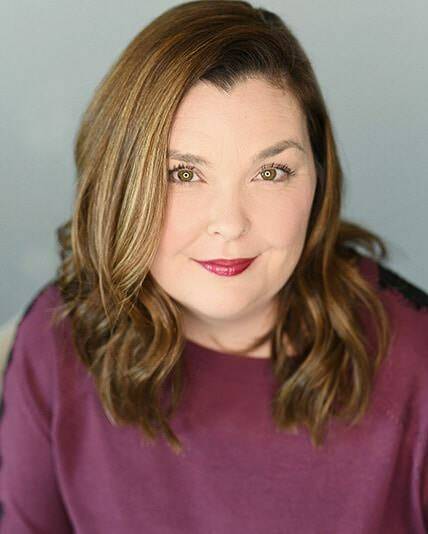 Any tips you would like to share? Let me know in the comments. Happy Summer everyone! What size trays do you use (the ones pictured)? They are about 2 inches high and about 8x10ish? I just buy whatever size I can find that is deep enough.